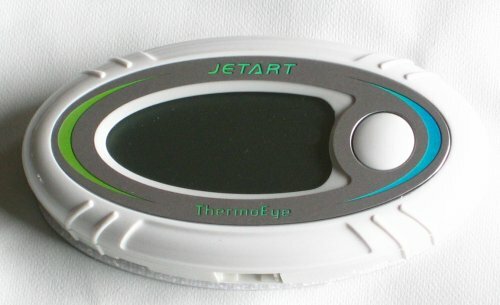 The DT2000 "Thermo Eye" from Jetart is a small gadget with two temperature sensors. 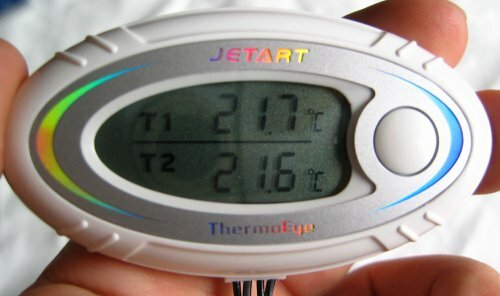 The product is marketed as a tool to monitor temperatures of various computer components like graphics cards, memory, heatsinks, hard drives or your case's temperature. 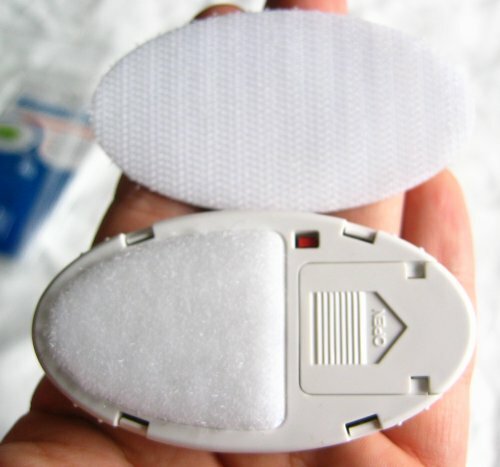 The ThermoEye is oval-shaped. It's made out of plastic and has a white colour. These are the two thermal sensors. As you can see the cables are pretty long. The plastic package also contains two pieces of tape to attach the sensors to whatever you want to monitor. 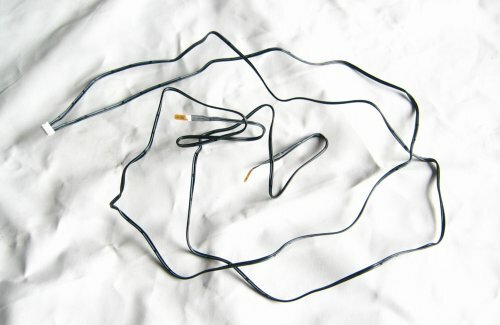 The ThermoEye comes with Velcro mounting material so you can easily attach the gadget to an object like your computer case. 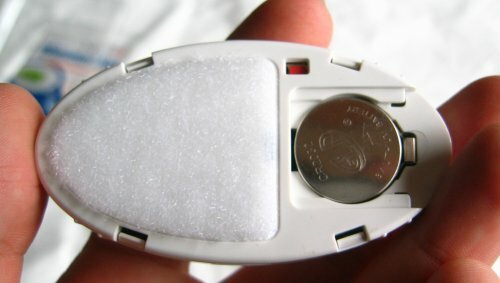 The power source is a small coin-shaped CR2032 battery and there's also a red Celsius/Fahrenheit switch. 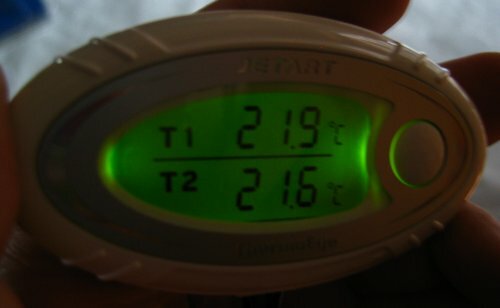 The display is split in two, the upper part shows T1 and the other half shows T2. One press on the white button on the right will turn on the green backlight. Unfortunately this backlight goes off automatically after about 20 seconds, you can't turn it off yourself. It's possible to use this product to monitor the temperatures of CPU, GPU or chipset cores but I don't really recommend this as sticking a sensor between the core and the heatsink will result in lower thermal conductivity. You could also use it to check in and outdoor temperatures but unfortunately the device can't go below 0°C so it won't be of much use during cold winters. 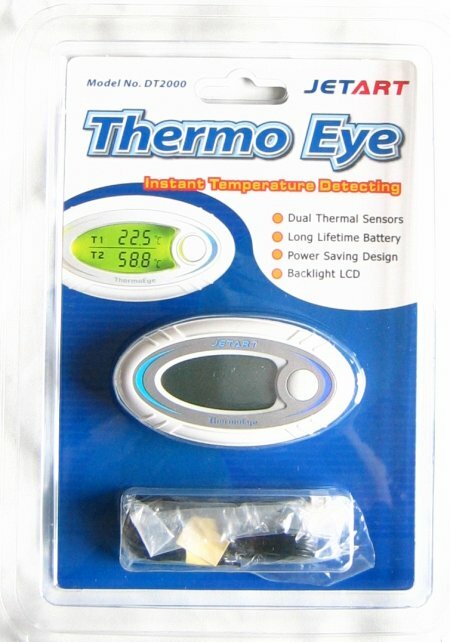 Well there's not really that much to say about the ThermoEye as this product has very little features. It measures two temperatures simultaneously, has a backlight and that's about it. The product works fine but some more features would have been welcome. I give the Jetart ThermoEye a 7.5/10.